Michael Hurley is the RTC correspondent for the Patriot League and America East Conference. Click here for all of our 2009-10 Season Preview materials..
What You Need to Know. American’s dominance it seems will come to an end this year after back-to-back Patriot League championships. The “American” have seven freshman on the 2009-10 team, and the current team has zero combined starts between them, so they will experience a steep learning curve. With the most well known coach in the PL gone (Ralph Willard at Holy Cross), we will have to see if Sean Kearney can carry the torch with a squad full of talented returning players in Worcester. With his experience coaching at this level, I am willing to bet he can, which is why they are my pick for the conference champions. As a whole, the entire league returns more talent this year than any year in recent memory. Marty Leon is the RTC correspondent for the Patriot League. Leon’s Leads – Tom Brennan to Georgia !!! The Current ESPN Hoop analyst and Georgia Alum could bring his Vermont Magic to Athens. Rush the Courts Ten Reasons Why Tom Brennan Could Coach Georgia !! Will demand academic performance of players. Turned losing Vermont team into nationally respected program. Never takes himself to seriously. People of Georgia would love him. Would be a great addition to homecoming festivities. 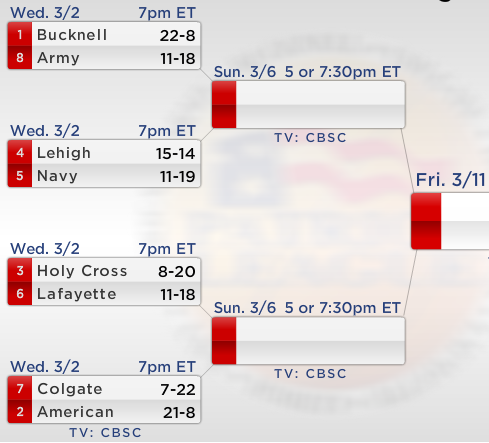 At 6-1 in the league, Holy Cross has proven they are for real and the top contender to take the title away from American. Freshmen R.J Evans has been awesome, averaging 13 ppg and second in the league in steals. The guard from Norwich Free Academy in Connecticut has been rookie of the week SEVEN times!! Andrew Keister has helped carry the load, leading the Patriot in field goal percentage and seventh in rebounding. Ralph Willard has done a great job regrouping his team after a rocky injury plagued start to the season.